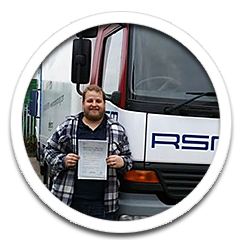 Teacher Martin Stevenson from Canvey Island came to RSM Commercial Driver Training to learn to drive a minibus and pass his PCV Category D1 licence. Having moved to a different school Martin needed to be able to drive the school minibus to transport the school pupils to PE fixtures. The 32 year old teacher completed his PCV training course with us earlier this year and passed the PCV driving test first time. My Trainer Treena was superb, she was very knowledgeable taking me on plenty of different routes and provided all the relevant information that I needed to know to pass my test (first time) Everyone in the office was friendly and approachable and nothing was too much trouble. When we asked Martin what passing the course would mean for him and the school, he said; “I will /have been able to drive sports teams and assist other colleagues in getting to fixtures helping to save the school money on transport costs”. We have trained a number of teachers and school staff members to drive minibuses safely, pass the PCV test and gain the Category D1 driving licence. In some cases we have even provided refresher driver training courses; for those with the entitlement on their licence, but who may have not driven a minibus for a long time, or never driven one before. Apart from understanding the safety implications and the responsibility that comes with driving a minibus full of passengers, we believe our driver training gives drivers the skills and confidence to competently get behind the wheel and know that they are doing out on the road. You can read more about our Minibus Driver Training Courses here. If you would like more information please contact our customer service team.